By hosting a food drive at your office, school, club, or place of worship, you can help the Gospel Mission continue to meet the needs of many people in our community. We love to list food and fund drives on our website and facebook and twitter pages. Some donors visit our site to see where they can bring food donations, so giving us your information may help increase participation. Even if your drive is internal and you aren’t looking for outside donations, telling us about your drive will help us to keep track of when to expect new food items to arrive. If you’re planning an office drive, get management involved- offer an incentive for bringing items. Have your coworkers “pay” 5 food items to be able to dress down on Friday, or ask management to offer up a half day or full day off to the person or department that brings the most items. See if your company would be willing to match cash donations, or match each food item donated with $1. Send emails to everyone in the office and put up fliers in high-traffic areas such as bathrooms, elevators and bulletin boards. If you’re planning a food drive at a school, have a competition between classes to see who can collect the most items. Have a pep rally to kick off the drive- give us a call and we can send a Mission staff member to speak to the kids. Have some art students make unique food drive fliers to hand around the school to remind everyone about the drive. Give updates on who is winning the competition on a daily or weekly basis over the PA system. Have a reward for the winning class- maybe a pizza party or ice cream sundaes. If you’re having a one-time event- a PTA meeting, a baseball, football or basketball game, a school dance, or a business retreat- spread the word as early as possible, and send a reminder a day or two before the event. If there is only one day when you are collecting food items, it’s important to remind your group a few times so that they remember to bring their items. Cans for Coins, Coins for Children-collect pocket change and donate money directly to the Mission. Coin and Can Day- drop off a can and a coin. Coin Wars- plan a penny war between classrooms or offices. Each class collects change in a container. Students throw dollar bills into the container of a another classroom in order to “cancel out” that class’ change. In other words, change in the container equals “positive” points, while bills equal “negative” points. The team with the most positive points at the end of the war wins! Canned Immunity Day-allow students to receive immunity for being late, forgetting homework, or being out of uniform if they bring in canned goods. Food Day-designate days of the week for specific foods, i.e. Macaroni Monday, Tuna Tuesday, Wheaties Wednesday, Turkey Thursday, Fruity Friday. Special Dress Day- students or employees “pay” with food to dress a special way. Let’s SAC Hunger or TGIF (Take Groceries In Friday)-provide brown bags to take home and fill with food or encourage them to bring a brown bag lunch and donate the money they would have spent on a school lunch. Bag Hunger Auction-collect auction items from home, “sell” admission tickets (cost of ticket = food item), hold the auction, and then the proceeds benefit the Silver City Gospel Mission. MEAT the Need-canned meat drive. Make Every BEAN COUNT- canned or dried beans drive. Read to Feed-for every book a student reads, a can of food is donated. Food Drive Event- have an event, party, or production as part of the drive and charge “food admission”-the admission price=a certain number of food items. Fruity Fines-for one day or several, the school, public or University library allows students to “pay fines” with canned fruit or other food items. Let the Stars Come Out-use a local celebrity to help increase publicity and contributions. Fill ‘er Up, Stuff-a-Bus, Fill-a-Truck, Fill A Shopping Cart-fill the Principal’s or manager’s office, gymnasium, truck, bus, or other designated area with food. Outline a map of your state on your gymnasium floor, athletic field, or school grounds and fill in area with food. Wash Away Hunger-a car wash where the price of wash is a food item. Hunger Walk, Run, Bike, or Dance-a-thon-have sponsors pledge food instead of money. Lots of people forget to bring their items while they are dealing with the everyday stress of life- consider collecting cash or check donations as well. Checks can be made out to “Silver City Gospel Mission,” and you can mail them to us after the event. If you collect cash donations, we do not recommend mailing cash- bring your cash to the Gospel Mission along with your food collection, or contact us to work out logistics. Whether you’re at a school or an office, everyone understands a goal. Some groups have set a numerical goal- collect 5,000 cans of soup, or 1,000 boxes of cereal. Other groups strive to fill an object- an outdoor store might try to fill a canoe with food, or a school might try to fill 5 recycling bins. Something visual always motivates people to participate- if possible, keep your canoe or recycling bins in a public area so everyone can see how the drive is going. If you’re close to your goal and everyone sees it, they might be more willing to help get you that last little bit. Have food you would like to donate personally? Bring your food donations to the Gospel Mission at 111 S. Texas St. We are located in the building with the large cross on it in the parking lot behind Jalisco’s Restaurant. Our hours are 8:30 am-1:30 pm Monday thrugh Friday. If you are holding a food drive, or for those who have difficulty getting to us, there are some other options. Depending on your location and the volume of food you have to donate, we may be able to arrange a pickup. A growing number of children are helping the Mission stock our shelves by asking their friends to bring food items to their birthday parties rather than gifts. Rather than accumulating piles of gifts that will never be used, email Randy at manager@silvercitygospelmission.org to find out what types of food items are in demand and have your child’s friends bring those food items to donate. Instead of parents going out each month to buy birthday presents, they can pick up some extra items at their next grocery store run. This helps to feed the hungry in our state as well as teaches your children about the importance (and reward!) of charitable giving. Do you want to host a food drive, but worry about where you will put all those cans? A Virtual Food Drive may be the answer! Contact us and we will be able to set up a web page for you with a shopping cart of food items that your friends can buy by clicking on the link which will take them to a shopping cart where they can pay. Promote your drive by asking your friends to join your Virtual Food Drive by sending them an email, or share it on Facebook, Twitter, LinkedIn and more! For each $1 donated, we can distribute over $10 of food, enough for about four meals! In fact, over 96 cents of every dollar donated goes to our food and programs. Recognize committee members, participants, sponsors and volunteers for their hard work. Host a pizza party or ice cream social in their honor! Have students create hand-made thank you notes. 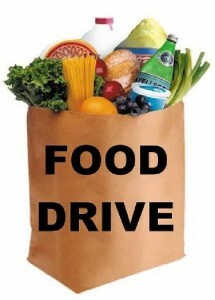 Share the post "Host A Food Drive!"